Cleveland’s self-styled enemy of “corrupt and inefficient politicians”1 was born in 1896, inspired by what its founders considered the disastrous state of local politics. For more than a century, fueled by righteous anger and empirical data, the league tackled big and small challenges, winning some battles and losing others. The Cleveland organization, originally called the Municipal Association, took its cue, as well as reforms like municipal home rule and a professional city manager, from the National Municipal League. This organization, later the National Civic League, was established in 1894. Its concern: American cities, their governments designed for smaller, more homogeneous populations, were overwhelmed by rapid, unplanned growth and the difficulties of absorbing an enormous influx of European immigrants. The serious depression that began in 1893 exacerbated these problems, creating widespread unemployment and political unrest. The results: political bosses and machines, patronage, mismanagement, and disorder. The league’s founders included some of the Progressive era’s leading lights, including Teddy Roosevelt, later President of the United States, and Louis D. Brandeis, later U.S. Supreme Court Justice. Like other Progressive reformers, these men believed that professional direction and scientific principles could solve urban political problems. The association held its first national meeting in Cleveland in 1895. Almost all were businessmen like William and Samuel Mather, John Sherwin, or Tom L. Johnson, associated with the city’s leading industries or commercial establishments, plus a few professional men – academics like Garfield, H.W. Bourne, professor of history at Western Reserve College for Women, and lawyer Frederic C. Howe. The group also included a handful of prominent Jewish men: Rabbi Moses J. Gries, Martin A. Marks, and Morris A. Black, who became the group’s second president. All were white. Quite logically, they believed that if political institutions operated like efficient businesses with well-informed men like themselves at the helm, all would be well. “To promote businesslike and efficient conduct” in government was their goal. 4Quite logically too, they were never critics of free enterprise capitalism and never endorsed even the mild “gas and water socialism” – that is, municipal ownership of utilities – advocated by reformers like Johnson and Howe, both of whom soon became disenchanted with the group. 1 The Citizens League of Cleveland, 1896-1946: Fifty Years of Critical and Constructive Service ( Cleveland: Citizens League of Cleveland, 1946), 3. 4 75 Years of Doing Good: The Citizens League of Greater Cleveland, 1896-1971 (Cleveland: The Citizens League of Greater Cleveland, n.d.), 7. The Municipal Association’s first challenge was to defeat McKisson’s 1897 re-election bid. The association’s publications made no explicit recommendation, or condemnation, of his administration, but simply laid bare the facts, at least as members saw them. McKisson won. Two years later, the association took off the gloves and distributed thousands of handbills urging his defeat and charging, “City Government [Is] a Disgrace.” “A corrupt political machine is in power in Cleveland. The first duty of the voter is to crush it.”5 The association also staged a “splendid and enthusiastic” meeting at Gray’s Armory to rally the faithful to the cause of good government. Banker J.W.G. Cowles decried “machine” politics as “the voice of the devil.”6 McKisson lost. The association did not make another recommendation for a mayoral candidate until 1989 although it continued its policy of doing research, providing information, and making recommendations for candidates for city, county, and state offices, sometimes Democrats and sometimes Republicans. In 1909, for example, the association recommended seven Republicans and three Democrats for Cleveland City Council after reviewing the credentials of 63 candidates. Here are two recommendations: “[Democrat] THOMAS B. FLOWER, present member of the city council. Mr. Flower’s work in the council has disclosed that he is a man of ability and is qualified for the office. …. [Republican] THOMAS W. FLEMING, lawyer and proprietor of a barber shop …. Is regarded as intelligent and trustworthy and of sufficient ability for service in the council.”9 Fleming was the first African American to be elected to Cleveland City Council but in 1929 went to jail for corruption in office. In 1910, Mayo Fesler became director of the association, a position he held until 1945 except for the years, 1917 to 1923. Under his direction, the association became the Civic League in 1913 and then the Citizens League in 1923. By 1971, it had become the Citizens League of Greater Cleveland, an acknowledgement that by then most of its members lived outside the city. (It will be referred to hereinafter as the CL or “the league.”) In 1913, Fesler organized the City Club of Cleveland, an organization still committed to free and open political debate. When he died in 1945, Fesler was eulogized as “one of the most ardent fighters for the cause of good government in Cleveland’s history.”10 On his watch the league would establish itself as a force for successful political reform. 5 75 Years of Doing Good, 3-4. 6 Cleveland Plain Dealer, March 29, 1899: 1. 7 75 Years of Doing Good, 9. 8 Tom L. Johnson, My Story (Kent, Ohio and London, England: Kent State University Press,1993), 171, 114. 9 Cleveland Plain Dealer, October 29, 1909: 4. 10 75 Years of Doing Good, 32.
strictly local affairs,” free from the “constant interference from the state capitol” that had made local governments “pawns in the game of state and national politics.” State governments, sometimes corrupt, passed “unintelligent and irresponsible legislation” for cities, the league charged.12 Home rule, in contrast, would bring the city’s government closer to its citizens and more accountable to them. In 1916, the CL became a forceful advocate for a city manager form of government. This appealed to the league and other Progressives because it placed important administrative responsibilities in the hands of an efficient nonpartisan expert instead of a partisan mayor likely to distribute jobs to his political cronies. Cleveland voters approved the city manager plan in 1921. 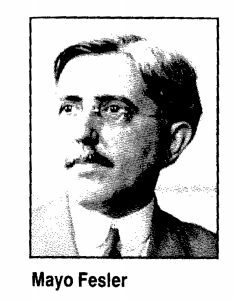 In 1924, city council chose William R. Hopkins as city manager; he was replaced in 1930 by Daniel Morgan. In 1923, the city experimented with the first of five elections to city council by proportional representation, another structural reform that was supposed to make council more representative and less corrupt. Baker seemed to have won the argument, for neither the city manager nor proportional representation ended corruption. Republican boss Maurice Maschke and Democratic boss W. Burr Gongwer found other ways to divide up the city jobs,19 and it was business as usual at City Hall. In addition, proportional representation voting was complicated, and vote-tallying was confusing and time- consuming. 12 Cleveland Plain Dealer, January 21, 1912: 11. 13 75 Years of Doing Good, 12. 14 David D. Van Tassel and John J. Grabowski, eds., Encyclopedia of Cleveland History (Bloomington and London, Indiana University Press, 1996), 534-5. 75 Years of Doing Good, 11. Cleveland Plain Dealer, October 26, 1916: 3. Van Tassel and Grabowski, 717. 18 C.H. Cramer, Newton D. Baker: A Biography (Cleveland and New York: World Publishing, 1961), 60-61. 19 Van Tassel and Grabowski, 801. Cleveland politicians and voters were disgusted and dismayed, and the league had to fight off efforts in 1925, 1927, 1928, and 1929 to repeal one or both reforms. The economic and political disorder of the Depression was the last straw, and voters repealed both the city manager and proportional representation in 1931.20 Cleveland returned to a popularly elected mayor and ward-based voting. Despite this cavalier treatment, the LWV, founded in 1919 to persuade women to become educated voters, generally found itself on the same side of most issues with the Citizens League. One major difference: LWV never endorsed candidates. During the first decades of the twentieth century, the farsighted CL championed many reforms later achieved: a smaller Cleveland City Council, voter registration, and lowering the voting age to 18. The league also lobbied the Ohio General Assembly for civil service laws for local, county, and state offices and protested an apportionment system that advantaged rural over urban counties. Much of its success derived from its Governmental Research Institute, established in 1943. Its publications over the next five decades hammered home the league’s familiar structural reforms for the city and county. The institute’s financial support from local government, foundations, and individuals also raised crucial funds for the league. Publications included “Civil Service Personnel in the City of Cleveland” (1949), “Voting Machines for Cuyahoga County” (1948), “The Sewerage Problem in Cuyahoga County” (1952), “Of Time and Traffic and How to Move About More Easily in Cleveland” (1956) , and “Ohio’s Apportionment and Subdistricting” (1963). 21 Cleveland Plain Dealer, March 24, 1900: 5. 22 Cleveland Plain Dealer, March 12, 1902: 2. 23 Cleveland Plain Dealer, April 12, 1920:13. 24 75 Years of Doing Good, 19. In 1967, one-time league president and long-time supporter of its reforms, Seth Taft mounted an historic campaign for mayor of Cleveland. Republican Taft, grandson of U.S. President William Howard Taft, faced off against Democrat Carl Stokes, narrowly losing the race that made Stokes the first African American mayor of a large American city. Taft then served as Cuyahoga County Commissioner, 1971-1978, a reminder of the league’s still-viable political presence. According to a poll done for the county Democratic Party, voters rated the league endorsement as the second most influential factor in picking the mayor. In 1989, the league broke an 80-year precedent and “preferred” County Commissioner Tim Hagan and City Council President George Forbes over several other candidates in the nonpartisan mayoral primary. One of the not-preferred candidates, then-State Senator Michael R. White, responded angrily: “It is a sad day in Cleveland that the Citizens League could endorse a political scoundrel like George Forbes. I’m sure the founders of the Citizens League are turning over in their graves.” White beat Hagan in the primary to run against – and beat- Forbes in the general election for mayor.31 At least in this case, the league endorsement had lost its influence. 25 Cleveland Plain Dealer, September 30, 1964:7; November 12, 1964: 6. 26 75 Years of Doing Good, 30-31. 27 Cleveland Plain Dealer, June 20, 1956: 6. 28 Cleveland Plain Dealer, December 3, 1978:135. 29 For the decades-long, politically divisive conflict between Cleveland Electric Illuminating and the municipal light plant, first called Muny Light and now Cleveland Public Power, see Van Tassel and Grabowski, 717-719. 30 Plain Dealer, May 23, 1982: C1. 31 Plain Dealer, September 12, 1989: 1. The league failed to get the necessary county home rule amendment on the state-wide ballot in 1917, but undismayed, lobbied the Ohio General Assembly for an amendment in 1919, 1921, 1923, 1925, 1927, 1929, and 1931. In 1933, the league got the amendment on the ballot by petition, and the amendment was approved by voters in the fall. An elected commission drew up a charter approved by a county-wide majority in 1935. Fearing for their jobs, elected officials took the charter to the Ohio Supreme Court, which declared it unconstitutional because it had not received a majority in all the areas outside of the largest city and in a majority of the municipalities and townships.37 Votes on a charter commission failed in 1936 and 1941. As suburban outmigration accelerated after World War II, however, the time seemed ripe for another effort. Voters approved a charter commission in 1949 but turned down the charter itself the next year, defeated, according to the league, by county officials, the mayor of Cleveland, and “provincial-minded suburbanites.”38 Throughout the 1950s, the league organized supporters, did studies, issued reports, and drew up its own version of a new simplified charter for county government. A more complicated charter was turned down by the voters in 1959.39 City voters were told that the new county government would raise their taxes; suburban voters feared loss of their autonomy. Efforts at reforming county government failed in 1969, 1970, and 1980. Cleveland’s ethnic and racial groups feared they would lose hard-won political power.40 In the meantime, however, there was movement toward centralization as Cleveland turned over its hospitals to the MetroHealth System, its zoo to the MetroParks and its transit and sewer systems to regional authorities. 32 Citizens League Research Institute, Public Opinion About Public Affairs in Greater Cleveland, 1988- 1990,(Cleveland: Citizens League of Greater Cleveland, October 1990), 1. 33 Citizens League Research Institute, Responding to the Cleveland Public Schools Financial Emergency: A Report to the Cleveland Board of Education and Superintendent” (Cleveland: Citizens League of Greater Cleveland, June 1992). 34 Plain Dealer, January 5:1993:6B. 35 75 Years of Doing Good, 19. 36 Van Tassell and Grabowski, 850-852. 37 75 Years of Doing Good, 20. 40 Van Tassell and Grabowski, 850-852. Instead, the CL in 2004 made still another stab at reforming county government, allied this time with the county Republican Party. The newest plan called for replacing the three county commissioners with a county executive and an 11-member council. The alliance failed to collect enough valid signatures to put the issue on the ballot, local business leaders withdrew their support, and the drive collapsed. So did the Citizens League; it had failed to pay its executive director for months. In July 2008, FBI raids on the Cuyahoga County Administration Building, the homes of public officials, and the offices of private companies uncovered the most corrupt administration in the county’s history. The scandal spread outward into suburbs, courts, school systems, the Cuyahoga Metropolitan Housing Authority, and MetroHealth Hospital. Although dozens of smaller fish got caught in the federal net, the real targets were top county officials: County Commissioner Jimmy Dimora (Public Official 1) and County Auditor Frank Russo (Public Official 2), both also powers in the county Democratic Party. Both subsequently went to jail. After months of subpoenas, arrests, trials, and imprisonments, disgusted voters in November 2009 did approve a new county government with a chief executive and 11 elected representatives, similar to league’s latest plan. And although defunct, or at least dormant, during this period of county crisis, the CL, the self-styled “scourge of corrupt and efficient politicians,” might have claimed a hollow victory in having said – for decades – “We told you so.” More positively, when Cuyahoga County government was re-constructed, the league might have taken credit for its decades of laying the groundwork for change. Talk of the kind of structural reforms that the CL has long urged – eliminating the duplication of public services and governmental entities – is still in the air. Its advocates now call it regionalism and point out that it would be efficient and save money. This is the argument used by the CL for decades, and should be an appealing one, since in 2014, Cleveland and the county’s suburbs and cities are strapped for funds, thanks to the collapse of property values in the recession of 2008 and a General Assembly in Columbus that is reluctant to share public funds. But as Joe Frolik has pointed out, the league’s proudest creation, the home rule amendment that gives autonomy to Ohio cities, towns, and suburbs, is the mightiest obstacle to regional government, the league’s most cherished cause. 43 And as it has for decades, voters’ deep loyalty to place or political position may well count for more than promises of a more efficient, less expensive government. 41 Plain Dealer, August 4:2002: 4.